We often share our feelings that while there are 100s or even 1000s of books are published every year, but not all of them has the substance. A few of them are written with the sole purpose of entertainment (and there is nothing wrong in it), while a few of them are written to explore some problems which we often like to avoid talking about. 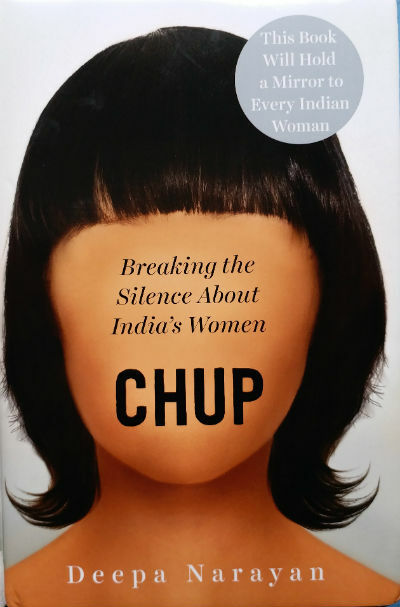 We are provided with the Hardcover copy of Chup: Breaking the Silence About India’s Women by Deepa Narayan, by Juggernaut books and we think that the point of view author has shared passionately must be explored. So, here are our unbiased views and reviews for the same. The cover page itself plays a vital role in the first impression of the book, and it can definitely influence the purchase decision of the reader, so let us take a look at the same. As you can see, the cover page is quite imaginative and at the same time it spreads the message as well. An unidentifiable female shown without the lips reflects the way a large number of them are made silent. The quality of the Hardbound book cover is quite good and it is durable. It seems that rather than making much of the money, the author/publisher have though about spreading the message to maximum number of readers, so they took really good care of binding quality and cover page. The book explores its content through 8 chapters. Let me list them out here, so you can get the idea of the book content. You need to remember a few things before you start reading this book. Though, it is written in the context of India, many of the problems explored are found throughout the world. The book is not written with an aim to defame India, Indian Society or culture in any way. While it tries to explore the problems women are facing, it is not saying that the other side is not there. Of course, there are liberals and genuinely open minded people, who makes the society actually a better place to live. The author herself talks about the support of all her family members (irrespective of gender) she got while working on this book. It also needs to be understood, that if the problem is there, one needs to talk about, and it doesn’t also mean that everything is wrong in its entirety. So, read the book only if you can read it with open mind. It is not about male bashing in anyway. Deepa Narayan doesn’t keep herself from talking about any problem that women, in the gender-biased environment experience. The book seems to be a work of a detailed research and we see the statistical information mentioned by the author to prove her point at almost each and every major point. The quotes mentioned in the book are taken during the conversation with real people and it makes the book authentic. What we come to know is that problems doesn’t lie only in uneducated or half-educated environments, the are seen in the well-educated environments as well! And, that is the bigger problem. If the education doesn’t try implanting values into the student and just prepare him/her for the professional career only, than can we call it an Education in the real meaning. While India is a land having documented history of more than thousands of years. It followed the Sanatan Dharma, which was now reduced to Hindu way of living. Actually, women were considered as the equal and there is a well-respected word “better-half” for the spouse. So, the culture was diluted in the medieval times. No matter what is the root cause of the same, we can update it and make a healthy society only if we care to do so. While, it is quite easy to make a prejudice about the book while reading it, that it is talking only about the negative things, there are positive attributes, and there are people who are really making the society a better place to live, and those who don’t believe in gender bias. Well, let us take it this way, when we visit a doctor, we will talk about the problem(s) we have. A doctor can come to the conclusion and decide the therapy only by exploring the symptoms and evaluating the problem; how otherwise it can be solved. As Indian prime minister Mr. Modi said in his first speech (as PM) from the Red Fort, that, while we keep ourselves vigilant for our daughters; where they go, why they are late and so…, but why aren’t we do the same thing for our boys as well? Often the root of gender discrimination found seeded at the early age and thus it becomes very tough to cut them out at later age. Reading the book will make you think twice about the advancements the humankind has made. If the society is not healthy and if doesn’t provide an equal opportunity to everyone how can we call ourselves progressive or advanced? The typography of the book is quite good. The book is more like a documentary and is not riveting like normal books which explore the fantasy fictions or thrillers. At the same time, there are many places where you can relate to the incidents explored in the book in one way or the. You might have witnessed some of them, and you might have heard or read about some of them. I feel that if the author could have made the last page (or couple of pages) of each chapter talking about positive stuffs (from real life incidents, news, history or anywhere) for the same perspective (explored in the chapter) it could have been a balanced approach. And, the book could have been better. It would then show the real problem, and at the same time, show some of the realistic ways to overcome it, or provide guidelines for the same. The author and publisher requires appreciation for talking about and publishing something important yet most of the people don’t like to talk about. This book is not for everyone. If you want to read something with a substance, talking about a real problem, and can digest some hard talks, then only go for this book.